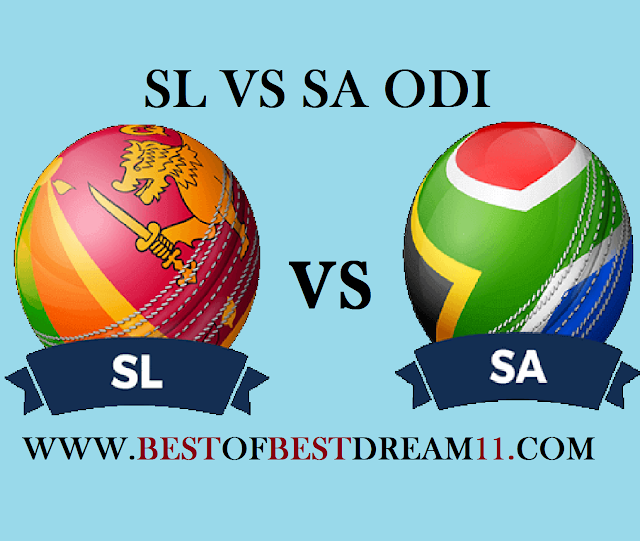 Here is best "SRILANKA VS SOUTH AFRICA " Fifth odi match,DREAM11 Predictions for the Fantasy user,who venue are looking to make a strong team for maximum win. We are providing latest news, match update, information about the match .The team is picked by using various factors on the basis of performance, ground stats and latest form. Sri Lanka ended their 11 match losing streak by beating South Africa in the last match at Pallekele. The Sri Lankan team first scored a score of 306 runs(39 over) . On reply, South Africa team could only manage 187 run in 21 over. In rain-affected match, Sri Lanka won by 3 runs under the Duckworth-Lewis Rules. 1-for south Africa, JP Duminy has been successful on this tour and has scored 215 runs at an average of 72.00 so far. 2-Q De kock(23run) and H Amla(40run) also had a good innings in the last match. 3-Lungi ngidi has bowled quite a lot in this series and he has taken 7 wickets. 4-N Dickwella (34run),U Tharanga(36run),K Parera(51),D Shanaka (65run) and T Parera(51) played quite well on behalf of Sri Lanka. 5-Lakmal (3wkt) and Perera (2wkt)took wickets while bowling superbly in the last match.